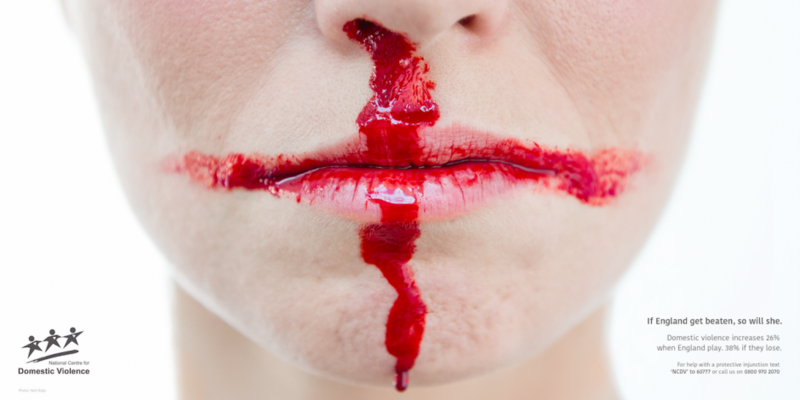 When they win they attack NHS ambulances, Alsatians and Ikeas, when they lose they attack their wives and girlfriends (domestic violence increases 26% when England play and 38% when they lose). Of course, being an England supporter doesn’t make you a racist, or even right-wing, but it does mean you’re rubbing shoulders with racists and right-wingers and contributing to an environment where their symbols are not only normalised, but celebrated. Usually, if I spot someone draped in St George’s flags, I can be pretty sure of their politics. At the moment, I can’t tell the difference between an EDL supporter and your average, ordinary English football fan. It’s not as if England fans sing about peace and love to all humankind, is it? They’re not singing about rainbows and unicorns. So, being an England fan out and about means, maybe not joining in ‘God Save the Queen’, ‘Rule Britannia’ and ‘No Surrender to the IRA/Taleban’, but certainly tolerating the inherent monarchism and militarism of English nationalism. Even ‘it’s coming home’ has inherently chauvinist connotations: as if England has some kind of ownership of this global game and is the natural home to its number 1 trophy. This sense of superiority pervades English nationalism: we’re the best, we’re cleverer, we’re stronger, and therefore it’s only right that we had an Empire, crushing foreign peoples under its boot, and ruling over “the childlike races” for their own good. In more recent times, Britain has used a diluted form of chauvinism, which nevertheless has a long tradition in England: fairness. The English are the most *fair*, and therefore are entirely justified in encroaching other nations’ sovereignty and blowing them to smithereens – these are known as ‘humanitarian interventions’. If you’re unsure how England’s depiction of itself as ‘fair’ has anything to do with white supremacism, as a young boy I was often told, when not playing *fair*, to “play the white man”. And during this tournament, I heard its echo repeated again and again: those “dirty” Colombians simply were not “playing the white man”. Alan Shearer emphasised that it was “in their culture”, unlike in England of course, where Ashley Young can barely run a few yards before tripping over a blade of grass. “We don’t do that here” they kept saying. It wasn’t just the pundits, who have no obligation to hide their biases and prejudices, the commentators too – who are supposed to at least give a semblance of objectivity – were constantly admonishing foreign players for, you name it, diving, theatrics, arguing with the referee, etc ad nauseam. Ok, you could argue that they’re right and this stuff is not nice to see. But I listened very carefully: they didn’t once say a dickybird about the England team. And they repeatedly ascribed behaviour to the respective cultures. The ethnic diversity in the England squad does not negate this. As long as they’re representing England, they’re fair, upstanding gentlemen with integrity (for their clubs it’s another matter, just look at how Raheem Sterling has been persecuted by the press). The point is, when you’re supporting ‘England’, this contributes to support for its ruling class. It’s no coincidence that members of the ruling class take such a great interest, or its representatives in the media take such pains to get the message across. It’s all about pulling together, isn’t it. We’re all one big happy family. Never mind that this same ruling class is attacking its working class, throwing ordinary English people out of their homes, from their jobs, cutting public services, pensions and employment insurance. That’s all fine, because we’re all English, aren’t we, and we all support the football team together. That’s why little videos of the likes of Prince William (who is President of the FA, by the way) flash up before the match, with some well-practised demotic: “come on England!”. Some have argued with me that we should support England because of its ethnic diversity. But it’s not about the players (who I have nothing against). This argument takes the same form as “Let’s support American bombs because they were ordered by a black man”. Others point out that all nationalism is like this, a sense of superiority, and all football fans have their bad apples and hooligans. Maybe so, but not all nationalism is the same: if your country has suffered decades or even centuries of oppression by Western imperialists, it has a humiliating and dehumanising effect, and your nationalism can have a restorative or invigorating result. Not so with the nationalism of England and Britain, which has been used and is still being used to exercise control over foreign nations and brutalise their people for profit.